The recent ITMA exhibition in Milan was one of the most successful exhibitions ever in the 70 year history of R+F. Over 450 visitors at the prominent R+F booth mark a record. But more important is the large number of discussions with high professionals who showed great interest in the latest developments of German Reiners + Fürst. 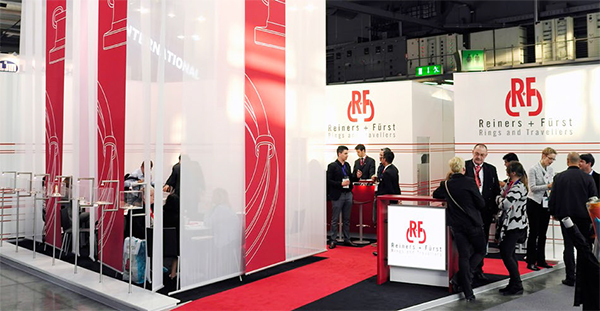 During the show R+F presented the next generation of TURBO chromium coated rings and a selection of enhanced ring travellers. R+F is thankful to all customers and reports a 3 times higher order intake during ITMA than expected. Many customers contact R+F in search for advice and solutions not only involving rings and travellers but also about possible optimization of the whole spinning frame. This fact underlines the trust customers have in R+F’s product developments and high professional expertise in the field of ring spinning. Together with its world-wide network of agents and warehouses R+F stands as a reliable partner to the ring spinning industry.